« Crochet in Fashion: It’s Time! 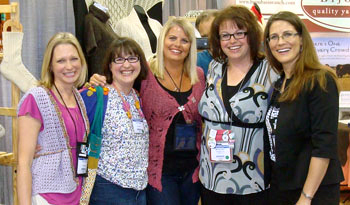 Last weekend I went to Columbus Ohio for The National Needle Arts Association trade show. Wow. Just wow. I had been thinking about going for a while, but was a little bit scared to spend the money, and afraid that I wouldn’t know anyone. Boy, was I wrong to have skipped any shows. Once I got to Ohio I instantly came alive to reconnect with old friends from my Adorn/Soho days and new crochet and knitty buddies that I usually only get to talk to online. Aside from the yarn (that’s another post) it was so, so nice to spend time with my peers. In my day to day job, I don’t really have “coworkers”, so it’s fun to get out of the hole that I seem to work in and see what everyone else is doing. Early on I met with Ellen Gormley, aka GoCrochet. Ellen’s crochet designs are in all of the crochet magazines and she even has a top-secret book project coming up. Unfortunately she’d have to kill me if she told me what it was, so I have no further information for you. She writes a great blog about the day-to-day life of a crochet designer, which I like to read just to make sure I’m doing things in a halfway-normal fashion. Ellen sent me this and the next photo because I took a grand total of about 10 pictures during the four days I was there. and the upcoming Crochet So Fine: Exquisite Designs with Fine Yarns (I’m very excited about this one!). Earlier I had introduced myself to her on the escalator and nearly caused her to slip (too much coffee/excitement for me) but then by the time we got around to the designer dinner we were laughing so hard that our cheeks hurt (thanks in part to the antics of Shannon Mullet-Bowlsby– ahem, Shannon, those pics got eaten by my camera which is probably best for us all!). I really enjoyed getting to meet Kristin. 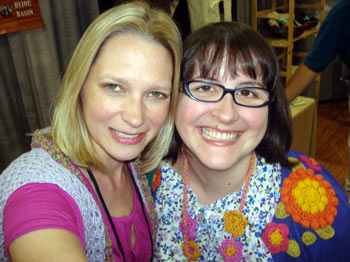 Marly is the reason I finally went to TNNA- she hosts her own Podcast (called Yarn Thing) and she had me on the show recently and then encouraged me to go. She’s also the design director for Bijou Basin Ranch and the much-loved coordinator of a dinner for all of the knit and crochet designers (thank you Marly!). Last but not least, Simona creates both knit and crochet designs for several publications. I have admired her designs for their wearability for a long time–I felt a kismet with her right off the bat and later we got a chance to chat about the business & viability of being a designer. Writing this paragraph makes me miss these ladies already! Here’s another fun photo of Doris Chan teaching Ellen to crochet broomstick lac. If you look closely you’ll see she’s using a makeup tube instead of a broomstick–clever! Wasn’t Ellen lucky to get a lesson from the master herself? If you’re interested in unique lace-making techniques, you should definitely check out Doris’ new book, Crochet Lace Innovations. 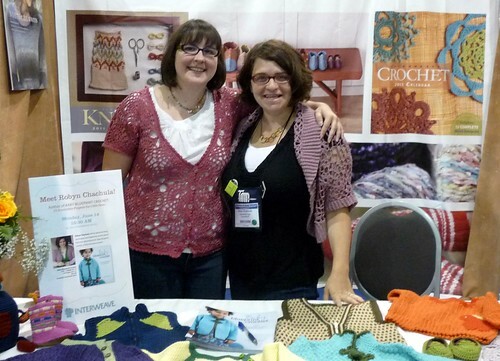 These ladies were at the Stitch Coop Party along with lots of other designers. There I had the chance to talk to Teva Durham about our shared experience of “working backwards” –ie writing the book, then working at the yarn shop (instead of the other way around), I think she is pretty awesome. Not to go crazy with book suggestions, but have you seen Teva’s crochet book, Loop-d-Loop Crochet? It was a breath of fresh air for me when it came out in 2007, and frankly, it still is! Oh, and how could I forget Robyn Chachula? By far one of my favorite designers–she was signing advance copies of her new book, Baby Blueprint Crochet, so I had to run over to see the samples and show her my Paige Cardigan (from her first book, Blueprint Crochet). She told me that she had all of the back issues of Adorn magazine…awww, that makes me happy. And just for the heck of it, here’s Bob-solda. 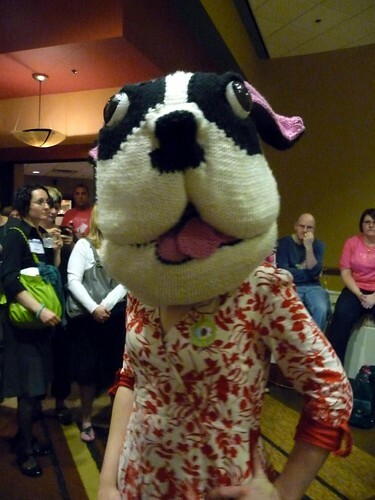 Also known as Ysolda Teague wearing a Bob (ravelry’s doggie mascot) mask. Her colorful, whimsical designs are all the rage in knitting right now. She momentarily donned the mask for the Ravelry Ice Cream Social, and was very sweet in person. I wasn’t shy about introducing myself to anyone…and even though I’m sure many of them had no idea who I was, they all feigned interest. Heh. Good thing I didn’t think too much, because looking back I think it’s pretty amazing that I got to meet so many people and blatantly promote my book –this post doesn’t even begin to cover the name-dropping that could occur! It really only covers the photos, so be thankful there’s such a small number of them. Now for the last thing I was introduced to. No, it was not a designer. 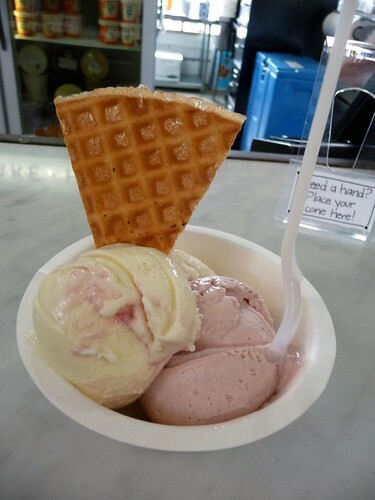 not even a person, but important nonetheless: Jeni’s Ice Cream. All that I’d read was true, she makes some super delicious unique ice creams. I think it’s safe to say that it was the the best ice cream I’ve ever eaten. Ever. Including Gelato. In Italy. Yum. I waited in line for about 2 hours to get my scoop at the Ice Cream Social and I would even call that worth it! I was talking to passionate yarnies the whole time, so really, how could I complain? I’ll try to pop in again with some yarn and tool roundups soon. But first to catch up on sleeping and eating. Looks like you had a great time! You smiled as much as when you see Teguearoo! where in Columbus was it held? I actually live about 10 miles north of the I270 loop.